In preparation for Blog Podium, I thought it was time to get some business cards made for the design/blog aspect of my life. In spite of the array of beautiful business cards available on Etsy, I couldn't seem to make a decision. And then I stumbled on Paper Sushi. Jennifer makes business card STAMPS. Ohhhh, do I love a stamp. And gorgeous handwriting. If you're in the market for any kind of stamp, I highly recommend Paper Sushi - I had such a great experience. I picked up an ink pad from Michael's - Color Box Pigment Archival ink in Black. Be warned, this ink takes FOREVER to dry. While at Michael's, I also grabbed a stack of 12x12 kraft card stock. This is thick card stock - almost like cardboard. The sheets of card stock are typically 99 cents, but I lucked out and caught a 4-for-99 cents sale. Each sheet made 18 business cards (with a little leftover). Then, I took the card stock to Fedex and they used their fancy cutting robot to cut the sheets to business card size for me, which cost approximately $9. Stamping them all was a little tedious. After all, I'm a bit of a perfectionist when it comes to these things, and I wanted the stamp to be perfectly centred. Plus, the ink took ages to dry (overnight). I LOVE the result though. Exactly what I was hoping for. Simple but unique. P.S. I'm not the only business lady in town ;) My fave designer lady, Sarah Richardson (WHO I GET TO MEET TOMORROW!!!!!) has a new show premiering tonight on HGTV! You know I'll be checking it out. These look awesome Vanessa! The tediousness totally paid off! Can't wait to see you tomorrow for tea, and Saturday at BlogPodium! Love an excuse to stamp anything...nice work!! love these! 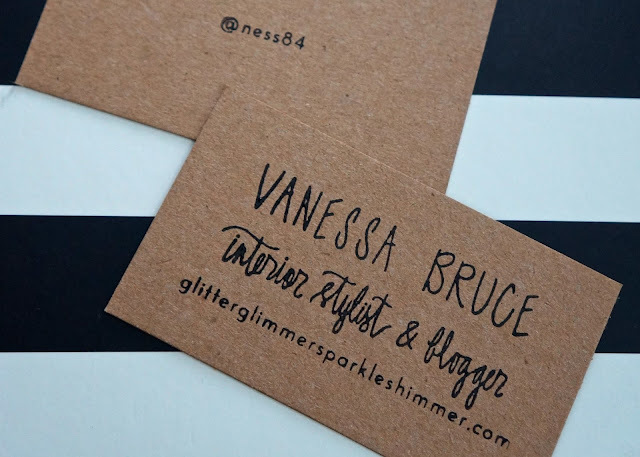 stamping business cards and still having them look polished is no easy task. you tackled it wonderfully! Oh I love kraft paper - I mean LOVE so these are timeless to me!